Here in Western New York we are blessed with some of the best freshwater fishing in North America! The steelhead & brown trout fishing in the tributaries of Lake Erie provides anglers with world class action during the spring and fall runs. These fish range from 4-12 lbs and offer great sport to fly anglers. The best part is that these fish are found in beautiful places. If you put a premium on catching fish in beautiful, unspoiled surroundings, come fish with us. 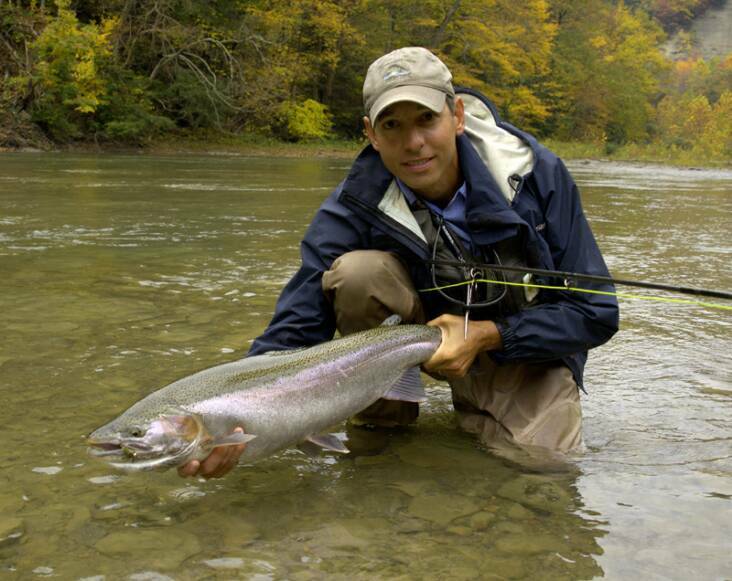 The Lake Ontario tributaries also offer excellent fishing for trophy steelhead & brown trout, as well as chinook and coho salmon. Western New York has many wild, secluded streams where you can fish in solitude and enjoy nature. It’s not uncommon to see bald eagles, deer, turkey, and fox while fishing under the canopy of old growth forest. We have access to many areas that are lightly fished, and we also have private property located on Cattaraugus creek in Zoar Valley, with two streamside cabins available for rent. The fish start entering the Cattaraugus in September, with October & November being the prime fall months. The fishing remains excellent well into December as long as the stream stays ice-free. The other Lake Erie tributaries also turn on in October and November, and provide a good alternative to the Catt for those seeking a change of pace. October, November & December are the top months on the lake Ontario tribs. 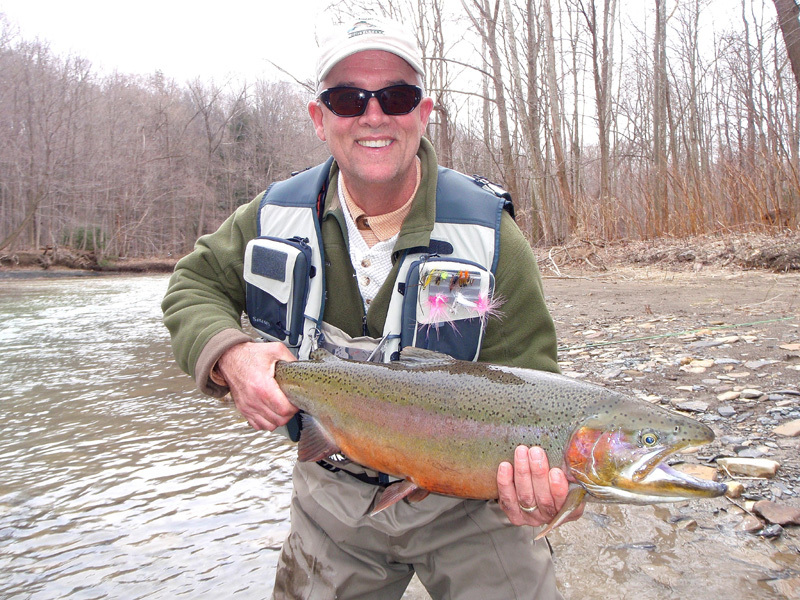 The spring is also a great time to catch steelhead in Western New York. March thru May finds our area streams full of both fresh fish and ones that have completed their spawning ritual and are dropping back to the lake where they'll spend the summer. The fresh fish, as well as the "drop back" fish, are hungry, very aggressive, and are excellent fighters. They love to chase streamers! As a bonus, from mid-April thru June the streams are loaded with 2-5 lb smallmouth bass which are great fun on the fly rod! CCO owner Vince Tobia was born and raised in Western New York and has spent over 35 years fishing this area. He knows where to find the fish and how to catch them, and will share his knowledge with you. He has a United States Coast Guard Captain's License and is a N.Y.S. Registered Guide. NYS licensed guides Rick "Fishman" Fisher, Nick Pionessa & Tom Cornell are also from western New York & have been fishing our area for many years. They know our local waters well, and are great guides. They are all patient teachers and love being on the water helping guests catch trout & steelhead. We also work with several other western New York licensed guides who have spent years fly fishing & exploring our streams and who will provide a productive, informative and enjoyable day on the water. All of our guides are from western New York, they fish our tributaries throughout the year and know our streams inside and out. We keep apprised of the constantly changing conditions on the Catt, which includes regularly altered riverbed structure--meaning that the fish holding runs on this system change from year to year--often more than once in a year. We strive to teach our guests the proper fly fishing techniques used to catch these lake run fish, as well as how to hook, fight, land and properly release them. We lean toward traditional fly fishing methods & spey casting for pursuing our lake-run fish. That means full floating or sink-tip fly lines using speys, wet flies and streamers. Nymph fishing is also productive when conditions dictate. The use of Spey and Switch rods is advantageous on many of our streams. We strongly support local conservation efforts. Vince is a Trout Unlimited life member, previously served on the Board of Directors of our local Western New York chapter of TU, and was formerly the editor for the chapter's monthly newsletter. Nick currently serves our local chapter; Rick & Tom are also active TU members. Vince, Nick, Rick & Tom are all dedicated conservationists and passionate trout fishermen. All trips require a 50% deposit upon booking. This deposit is fully refundable if the trip is canceled at least 30 days prior to the scheduled date. If more than two weeks notice is given, the deposit will be applied to a future trip. If less than two weeks notice is given, the deposit will be forfeited unless the date can be filled. In the event of un-fishable stream conditions in the entire region, this deposit will be applied toward a future trip. For those planning to fish a specific river, if that river is un-fishable we will fish an alternate river.